Home | Category: Get Connected! When code.org devised its first “Hour of Code” grassroots campaign a year ago, they never could have imagined the impact: in a mere two weeks, over 20 million people participated and over 600-million lines of code had been written. That led to another challenge this December for the week of the 8th to the14th, part of “Computer Science Education Week.” So far, 73 million people (and counting) have participated in 77,000 events held worldwide. 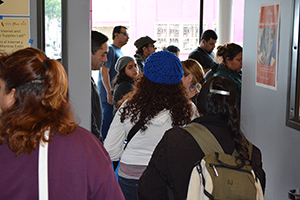 Jacinto Noriega, Mission Promise Neighborhood (MPN) Technology Manger, saw the perfect tie-in to the “Get Connected!” events being held at MEDA’s Plaza Adelante, the Mission neighborhood SparkPoint center. This fourth such event of 2014, held today, was sponsored by Google and Comcast, with involvement from the California Emerging Technology Fund. “I wanted our bilingual MPN families to have a chance to learn the real language of the future–coding. A Mission community-wide effort made today’s event possible, with great volunteers, MPN partners and MEDA staff all committed, as always. Also, we couldn’t have done this without the participation of Google and Comcast,” explains a thankful Noriega. There were five coding classes offered as party of “Get Connected!”: a trio of classes named “Learn How to Code”; and two “Learn How to Make an Android Application” sessions. Participants seemed to soak up the knowledge they were receiving, a new world being revealed. Today’s “Get Connected!” event featured other areas of interest to the low-income Latino community MPN and MEDA serve. People queued up to register for low-cost internet via a Comcast program called “Internet Essentials,” with cost starting at just $9.95 per month, plus tax. Erica Castillo, Broadband Coach, could be seen busily signing up event attendees, advising them that any child who receives free or reduced-rate lunch at school automatically qualifies for the “Internet Essentials” program. 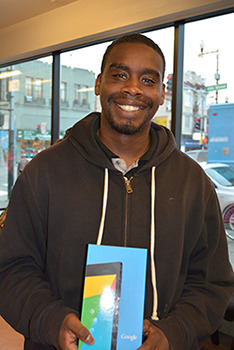 As a bonus, the first 50 to sign up for this low-cost broadband for the first time in their home were the recipients of a brand-new, free Nexus 7 tablet. This was part of a Google donation to help underserved Mission community residents have a computing device at home–an invaluable tool for families to help their children study and do homework and for parents to do everything from pay bills online to seek employment. Some of these same valuable tablets, along with gift certificates, were raffled off in every workshop. Since the “Hour of Code” is aimed at those ages four to 104, according to the founders, classes were offered for all age brackets at “Get Connected!” The “Digital Storytelling for Kids” workshop kept the little ones’ rapt attention as parents learned much-needed computer skills in classes geared to their age bracket. A bevy of MPN partners were tabling, availing the families of services in the Mission. Residents were engaged with these organizations, seeing how their family could succeed and their child achieve at school. 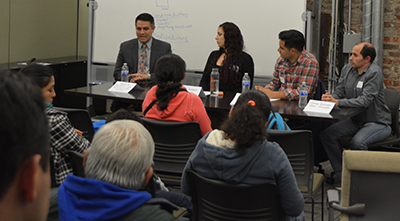 To counsel residents on how they can be part of the tech industry, which is such a large sector of the Bay Area economy, a “Latino Career Panel” spoke to the crowd. This panel was composed of power players in the tech world: Miguel A. Gamiño Jr., City CIO for the City & County of San Francisco/Executive Director, Department of Technology; Omar Estrada Diaz from Google; Juan Salazar from Facebook; and Anna Zulaica of LinkedIn. Many connections were made today among community residents, the double meaning of “Get Connected!” being showcased: low-income Latino residents being connected to tech; and residents whose paths do not often cross finally interacting, as new tech residents engaged with those that have made the Mission the vibrant neighborhood that today draws so many newcomers.